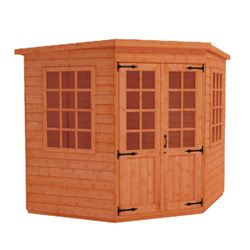 Utilise every corner of your garden with the addition of one of our stylish Corner Summerhouses. The Corner Summer house is manufactured using top quality timber for a luxury finish by our highly skilled craftsmen. Available in a range of sizes with attractive Georgian style windows and large double doors, the Corner Summerhouse is the perfect combination of quality, practicality and elegance. Find out more about our Corner Summerhouses range. 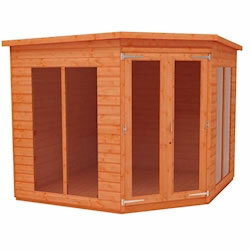 Enjoy the warm weather this year with our corner summerhouse: the perfect getaway space regardless of garden size. Our corner summerhouse features large multi-directional windows, designed to let in as much light as possible throughout the day, and the large double doors make the space easily accessible for all age groups. Manufactured from the highest quality pressure-treated superior grade 12mm finish shiplap cladding our summerhouses are built to last, as well as reducing the need for regular maintenance. At Tiger Sheds, we want you to be able to enjoy your perfect garden getaway year after year without worry, that’s why all of our summerhouses come with a minimum ten-year guarantee.